Homework, thanks everyone for all the loot! I woke up in the best way possible: well rested. And to a great new book at my door. Upon going to work, I had two — COUNT THEM TWO — coworkers share some more knowledge with me! I have a TON of reading to do and I don’t think I could be more excited. I had a fabulous lunch out with a fabulous gentleman friend who got to meet one of my other very fabulous gentleman friends. 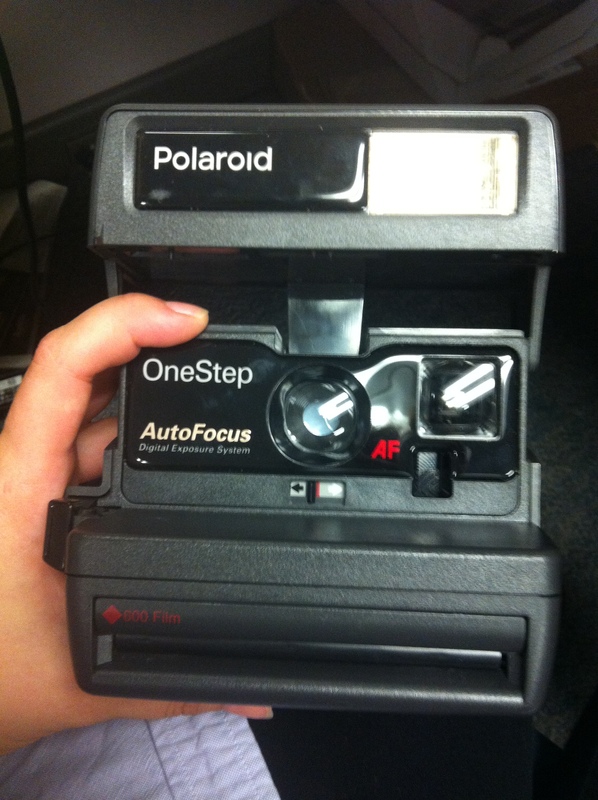 THEN I found a Polaroid. But not just a Polaroid, but one WITH FILM. This film is at least 9 years past it’s expiration date but hey, let’s give this a whirl. I’m shoving off into this foggy weekend early with my very good friend who’s getting married next week. There’s a surprise in store for her when we arrive at our location. Weekend jam: this awful tune that kind of sums up the feeling ’round these parts. This entry was posted in Portfolio, Uncategorized and tagged cozy, falling in love, fridays, hot date, knowledge sharing, mentors, Photos, polaroid, user experience, UX, weekend in, wings, working. Bookmark the permalink.